Gwen Ebert lives and works in Madison, Wisconsin. 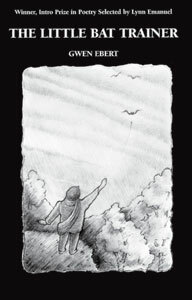 The inspiration for some of the poems in her book, The Little Bat Trainer (Four Way Books, 2002), is drawn from her experiences teaching outdoors in the Southwest. She is the author of a chapbook, Twig Songs (Parallel Press, 2000), and her poems have appeared in such publications as New Letters, Passages North, and Kalliope. She has been a recipient of Southern Poetry Review’s Guy Owen Prize, selected by Mary Oliver, Heart Quarterly‘s first poetry award, and a 49th Parallel Prize from The Bellingham Review. She received her MFA from the University of Pittsburgh.